The AL wild-card race has been incredibly close, but the Blue Jays appear to have finally broken through with five games to go. Plus, updates on the NL race and the home-run machine that is Gary Sanchez. Presented with a grand opportunity—the chance to grab home field advantage in this year’s wild card game from the Blue Jays with a series sweep—the Orioles were completely overmatched on Tuesday night in Toronto. Josh Donaldson and Ezequiel Carrera went deep off Kevin Gausman early, and Aaron Sanchez struck out 10 batters over six innings of one-run ball en route to a 5–1 Blue Jays victory in the first of a three-game set. It opened up their lead in the AL wild-card race to two games, putting them in very favorable position over the Orioles, currently clinging to second, with just five games remaining. Relocating the wild-card game to Camden Yards will now be more difficult after Toronto clinched the season series—the tiebreaker if the two were to finish even atop the wild-card standings—with Tuesday’s win. Everything's coming together at the right time for the Blue Jays; their potent offense has now scored 16 runs over the past five games, and their pitching staff continues to roll, entering Tuesday with an American League-best 2.68 ERA over the past two weeks. It’s hard to find a more dangerous team in the AL at the moment. One team that looked even better on Tuesday, though, was the Tigers, who lit up Indians starter Mike Clevenger and four relievers in a blowout 12–0 win. With the Orioles and Mariners losing, they’re positioned well to grab the final playoff spot in the AL at just a game back. Considering Detroit finishes the season in Atlanta, and Baltimore travels to New York, we could have a good fight on our hands. It’ll all depend on what the Tigers get out of the back end of their rotation. In the Bronx, the kid outdid the legend. 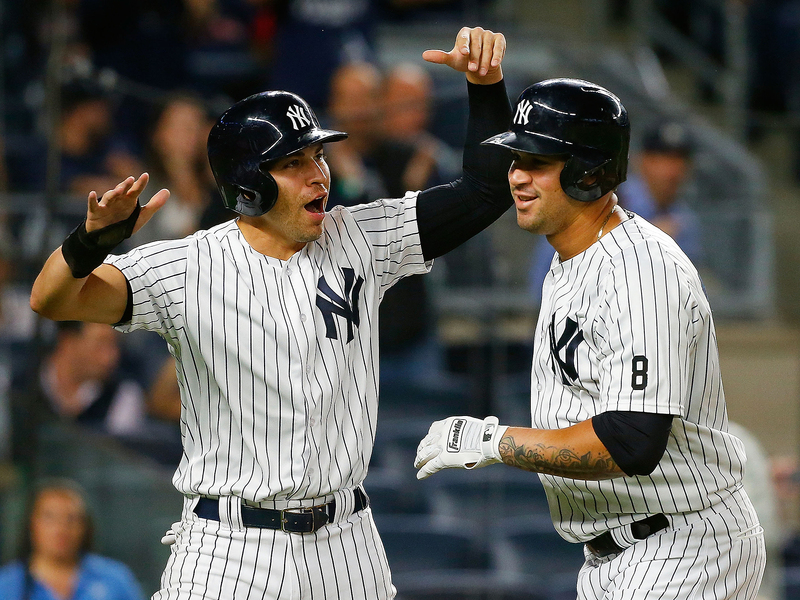 Gary Sanchez hit a majestic blast to left-centerfield in the first inning, his 20th of the season, to help the Yankees snap the Red Sox’ 11-game winning streak with a 6–4 victory Tuesday. Meanwhile, David Ortiz began his final series in New York with a rough 0-for-5 showing, representing the tying run in the ninth and striking out to end the game. Sanchez’s 20th blast came in just his 51st career game, tying him with for the fastest player to reach the milestone in league history. It’s remarkable, to say the least, that he’s knocked 20 out since Aug. 10 as a rookie. Austin, himself, homered on the evening, winning the game in the seventh with a two-run shot to right off David Price. Somehow, it paled in comparison to the other three times he’s hit home runs in his young career: His first big-league at-bat, his 25th birthday, and in a tie game in the bottom of the ninth inning earlier this month. On a night where many in attendance expected Ortiz to go deep, it was the budding Yankees star who did his best to spoil the beginning of the 20-year-veteran’s farewell. It’s highly unlikely that the AL MVP candidate goes hitless over the next two games, but his New York farewell isn’t off to such a hot start. With the win, the Yankees’ playoff hopes remain on life support. They have five games to go, and trail the Orioles by four games for the final wild-card spot, making their elimination number two. The Red Sox, on the other hand, don’t have to worry about making the postseason, but they’ll have to wait at least another day before uncorking some champagne and celebrating the AL East division title. The National League wild card race is now down to three teams—the Mets, Giants and Cardinals—and still unbelievably close. On the same day that the Mets learned they’d lose a third starting pitcher from their original rotation to season-ending surgery in Steven Matz, they left their perpetually-pessimistic fans feeling hopeful. Noah Syndergaard fired six innings of one-run ball, striking out eight, and both Yoenis Cespedes and Jay Bruce—yes, that Jay Bruce—went yard in a 12–1 win over the Marlins. With the Giants also winning in commanding fashion, they maintained a half-game hold on the top wild card spot, angling to host a one-game playoff in Queens. New York, against all odds, is right in this thing. There’s a chance that a rotation featuring 19-year-veteran Bartolo Colon, Seth Lugo, owner of a 4.70 career ERA in the minors, and 23-year-old Robert Gsellman could make it to the NLDS this year over the San Francisco’s formidable collection of starters. Could you fathom that? About that great Giants rotation ... Matt Moore, acquired from Tampa Bay at this year’s trade deadline, continued to be one of the most unpredictable arms in baseball. After crashing and burning in Los Angeles a week ago, giving up six runs in just one inning, he dominated a talented Rockies offense for 7 ⅔ innings on Tuesday, yielding just a run on six hits with 11 strikeouts in a 12–3 win. They’ll send Jeff Samardzija out on Wednesday, followed by Johnny Cueto and Madison Bumgarner. If it’s the Giants that they’re chasing for a spot, the odds are stacked against the Cardinals, who defeated Cincinnati 12–5 to remain a game back.